The fabulous Computer 50 Launch Event at the Bridgewater Hall took place on Wednesday 17th of June. Invited guests had come from as close as Manchester University and as far away as Asia and America to attend the Computer 50 festivities. Though I'd arrived without a ticket, I was given perhaps the best seat in the house - in the middle directly in front of the stage. We were treated to an impressive two hour multimedia spectacular, using lighting effects, still and moving pictures on large screens, and live drama, recreating the moment in 1948 when Tom Kilburn and Freddie Williams successfully got the Small Scale Experimental Machine to work. 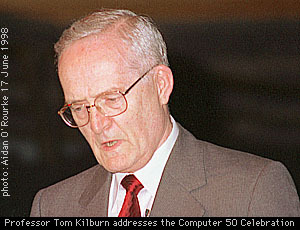 Professor Kilburn then came onstage and gave his personal perspectives on the events leading up to June 1998. During his talk, there was a link-up via satellite to the Museum of Science and Industry, about half a mile away. On screen was the smiling face of Christopher Burton, the man who led the team that rebuilt the "Baby", and whom I interviewed last week. Professor Kilburn and Lady Williams, widow of Professor Williams, onstage at the Bridgewater Hall, pressed the button and the program ran once again, displaying the words: "Hello World 1948".